Willa’s life is changing rapidly. Her father passed away and her mother has moved on with a Hollywood producer. Willa is uprooted from her comfortable life on the East Coast and moved to the California movie capital which also happens to be the set of a string of murders. I really liked the concept of this story. A murderer is targeting young actresses and posing their bodies to recreate famous movie deaths. The problem was Willa was new to town so there were really only three people that could possibly be the killer and I instantly knew who it was. My favorite part about thriller’s and murder mysteries is riddling out who the killer could be so my enjoyment of Famous Last Words was lessened by this. Despite knowing who the killer was I kept reading because I liked the characters and the creepy things occurring around Willa. Willa had visions of the murders were she was in the shoes of the victim and she kept witnessing strange things, like bloody words on the walls at her new house in the Hollywood Hills. Is it a ghost? Is Willa going crazy? You’ll have to read to find out! I also liked Willa’s first friend in Hollywood, Marnie. I liked her because we all know a Marnie, a girl who stretches the truth so far it becomes a lie, or lies because it is more interesting then telling the truth. I didn’t like her because she is a good person but because she is one of the most true to life characters I’ve ever read. 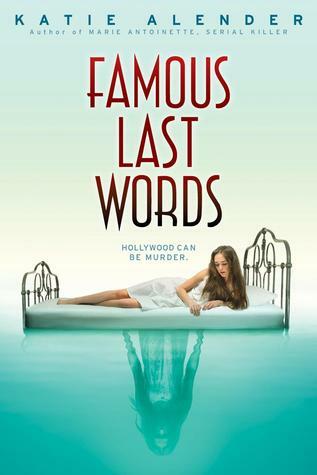 Overall, Famous Last Words was a fun read. Despite figuring out the mystery early I still enjoyed reading about Willa’s new life in Hollywood and the eerie things occurring around her. I would recommend this if you enjoyed The Secret Life of Lily Graves by Sarah Strohmeyer or want a light mystery. I'm in a thriller/mystery mood lately, so although the killer is found out easily, I think I'll check this one out. :) It sounds like an easy read, but still interesting. I'm happy you enjoyed this one, looks like it'd be a fun little mystery (although...not so mysterious). I read Bad Girls Don't Die by the authors a few years back and I really enjoyed it, I'm looking forward to reading more by her.